Zen (ចិនបុរាណ: 禪; ភិងអ៊ិង: Chán) is a school of Mahayana Buddhism that originated in China during the Tang dynasty as Chan Buddhism. Zen school was strongly influenced by Taoism and developed as a distinguished school of Chinese Buddhism. From China, Chan Buddhism spread south to Vietnam, northeast to Korea and east to Japan, where it became known as Japanese Zen. The term Zen is derived from the Japanese pronunciation of the Middle Chinese word 禪 (Chan) which traces its roots to the Indian practice of Dhyana ("meditation"). [note ១] Zen emphasizes rigorous self-control, meditation-practice, insight into Buddha-nature, and the personal expression of this insight in daily life, especially for the benefit of others. As such, it de-emphasizes mere knowledge of sutras and doctrine and favors direct understanding through zazen and interaction with an accomplished teacher. During sitting meditation, practitioners usually assume a position such as the lotus position, half-lotus, Burmese, or seiza postures, using the dhyāna mudrā. To regulate the mind, awareness is directed towards counting or watching the breath or by bringing that awareness to the energy center below the navel (see also ānāpānasati). [web ១] Often, a square or round cushion placed on a padded mat is used to sit on; in some other cases, a chair may be used. This practice may simply be called sitting dhyāna, which is zuòchán (坐禅) in Chinese, and zazen (坐禅) in Japanese. In the Sōtō school of Zen, meditation with no objects, anchors, or content, is the primary form of practice. The meditator strives to be aware of the stream of thoughts, allowing them to arise and pass away without interference. Considerable textual, philosophical, and phenomenological justification of this practice can be found throughout Dōgen's Shōbōgenzō, as for example in the "Principles of Zazen"[web ២] and the "Universally Recommended Instructions for Zazen". [web ៣] In the Japanese language, this practice is called Shikantaza. At the beginning of the Sòng dynasty, practice with the kōan method became popular, whereas others practiced "silent illumination." This became the source of some differences in practice between the Línjì and Cáodòng schools. The Zen student's mastery of a given kōan is presented to the teacher in a private interview (referred to in Japanese as dokusan (独参), daisan (代参), or sanzen (参禅)). While there is no unique answer to a kōan, practitioners are expected to demonstrate their understanding of the kōan and of Zen through their responses. The teacher may approve or disapprove of the answer and guide the student in the right direction. The interaction with a Zen teacher is central in Zen, but makes Zen practice also vulnerable to misunderstanding and exploitation. Though Zen-narrative states that it is a "special transmission outside scriptures" which "did not stand upon words", Zen does have a rich doctrinal background, which is firmly grounded in the Buddhist tradition. It was thoroughly influenced by the Chinese understanding of Yogacara and the Buddha-nature doctrine, Zen integrates both Yogacara and Madhyamaka, and the influence of Madhyamaka can be discerned in the stress on non-conceptual insight and the paradoxical language of the koans. [web ៤][note ២] Most essential are "the most fundamental teaching that we are already originally enlightened", and the Bodhisattva ideal, which supplements insight with Karuṇā, compassion with all sentient beings. What the Zen tradition emphasizes is that the enlightenment of the Buddha came not through conceptualization, but rather through direct insight. But direct insight has to be supported by study and understanding (hori) of the Buddhist teachings and texts. [note ៧] Intellectual understanding without practice is called yako-zen, "wild fox Zen", but "one who has only experience without intellectual understanding is a zen temma, 'Zen devilទំព័រគំរូ:' ". Religion is not only an individual matter, but "also a collective endeavour". Though individual experience and the iconoclastic picture of Zen are emphasised in the Western world, the Zen-tradition is maintained and transferred by a high degree of institutionalisation and hierarchy. In Japan, modernity has led to criticism of the formal system and the commencement of lay-oriented Zen-schools such as the Sanbo Kyodan and the Ningen Zen Kyodan. [web ៩] How to organize the continuity of the Zen-tradition in the West, constraining charismatic authority and the derailment it may bring on the one hand, and maintaining the legitimacy and authority by limiting the number of authorized teachers on the other hand, is a challenge for the developing Zen-communities in the West. Modern scientific research on the history of Zen discerns three main narratives concerning Zen, its history and its teachings: Traditional Zen Narrative (TZN),[web ១០] Buddhist Modernism (BM), Historical and Cultural Criticism (HCC). An external narrative is Nondualism, which claims Zen to be a token of a universal nondualist essence of religions. Proto-Chán (c. 500–600) (Southern and Northern Dynasties (420 to 589) and Sui Dynasty (589–618 CE)). In this phase, Chán developed in multiple locations in northern China. It was based on the practice of dhyana, and is connected to the figures of Bodhidharma and Huike. Its principal text is the Two Entrances and Four Practices, attributed to Bodhidharma. Early Chán (c. 600–900) (Tang Dynasty (618–907 CE)). In this phase Chán took its first clear contours. Prime figures are the fifth patriarch Daman Hongren (601–674), his dharma-heir Yuquan Shenxiu (606?–706), the sixth patriarch Huineng (638–713), antagonist of the quintessential Platform Sutra, and Shenhui (670–762), whose propaganda elevated Huineng to the status of sixth patriarch. Prime factions are the Northern School, Southern School and Oxhead School. Middle Chán (c. 750–1000) (from An Lushan Rebellion (755–763) till Five Dynasties and Ten Kingdoms period (907–960/979)). In this phase developed the well-known Chán of the iconoclastic zen-masters. Prime figures are Mazu Daoyi (709–788), Shitou Xiqian (710–790), Linji Yixuan (died 867), and Xuefeng Yicun (822–908). Prime factions are the Hongzhou school and the Hubei faction[note ៨] An important text is the Anthology of the Patriarchal Hall (952), which gives a great amount of "encounter-stories", and the well-known genealogy of the Chán-school. Song Dynasty Chán (c. 950–1300). In this phase Chán took its definitive shape, including the picture of the "golden age" of the Chán of the Tang-Dynasty, and the use of koans for individual study and meditation. Prime figures are Dahui Zonggao (1089–1163), who introduced the Hua Tou practice, and Hongzhi Zhengjue (1091–1157), who emphasized Shikantaza. Prime factions are the Linji school and the Caodong school. The classic koan-collections, such as the Blue Cliff Record were assembled in this period, which reflect the influence of the "literati" on the development of Chán. In this phase Chán is transported to Japan, and exerts a great influence on Korean Seon via Jinul. The first Buddhist recruits in China were Taoists. They developed high esteem for the newly introduced Buddhist meditational techniques, and blended them with Taoist meditation. Representatives of early Chinese Buddhism like Sengzhao and Tao Sheng were deeply influenced by the Taoist keystone works of Laozi and Zhuangzi. Against this background, especially the Taoist concept of naturalness was inherited by the early Chán disciples: they equated – to some extent – the ineffable Tao and Buddha-nature, and thus, rather than feeling bound to the abstract "wisdom of the sūtras", emphasized Buddha-nature to be found in "everyday" human life, just as the Tao. In addition to Taoist ideas, also Neo-Taoist concepts were taken over in Chinese Buddhism. Concepts such as "T’i -yung" (Essence and Function) and "Li-shih" (Noumenon and Phenomenon) were first taken over by Hua-yen Buddhism, which consequently influenced Chán deeply. One point of confusion for Chinese Buddhism was the two truths doctrine. Chinese thinking took this to refer to two ontological truths: reality exists on two levels, a relative level and an absolute level. Taoists at first misunderstood sunyata to be akin to the Taoist non-being. In Madhyamaka the two truths are two epistemological truths: two different ways to look at reality. Based on their understanding of the Mahayana Mahaparinirvana Sutra the Chinese supposed that the teaching of the Buddha-nature was, as stated by that sutra, the final Buddhist teaching, and that there is an essential truth above sunyata and the two truths. Bodhidharma. Woodcut print by Yoshitoshi, 1887. Bodhidharma is recorded as having come into China during the time of Southern and Northern Dynasties to teach a "special transmission outside scriptures" which "did not stand upon words". Throughout Buddhist art, Bodhidharma is depicted as a rather ill-tempered, profusely bearded and wide-eyed barbarian. He is referred as "The Blue-Eyed Barbarian" (碧眼胡:Bìyǎn hú) in Chinese Chan texts. [web ១២] Only scarce historical information is available about him, but his hagiography developed when the Chan tradition grew stronger and gained prominence in the early 8th century. By this time a lineage of the six ancestral founders of Chán in China was developed. The short text Two Entrances and Four Acts, written by T'an-lín (曇林; 506–574), contains teachings which are attributed to Bodhidharma. The text is known from the Dunhuang-manuscripts. The term "East Mountain Teaching" was used by Shenxiu (神秀 606?–706), the most important successor to Hongren. By this time the group had grown into a matured congregation which became significant enough to be reckoned with by the ruling forces. In 701 Shenxiu was invited to the Imperial Court by Empress Wu, who paid him imperial reverence. This gave his school the support and the legitimation of the imperial court. The school was typified by a "loose practice," aiming to make meditation accessible to a larger audience. Shenxiu used short formulas extracted from various sutras to package the teachings, a style which is also being used in the Platform Sutra. Members of the "East Mountain Teaching" shifted the alleged scriptural basis, realizing that the Awwakening of Faith is not a sutra but a sastra, commentary, and fabricated a lineage of Lankavatara Sutra masters, as being the sutra that preluded the Awakening of Faith. Blue-eyed Central Asian monk and East-Asian monk. A fresco from the Bezeklik Thousand Buddha Caves, Turfan of China, dated to the 9th century; although Albert von Le Coq (1913) assumed the blue-eyed, red-haired monk was a Tocharian, modern scholarship has identified similar Caucasian figures of the same cave temple (No. 9) as ethnic Sogdians, an Eastern Iranian people who inhabited Turfan as an ethnic minority community during the phases of Tang Chinese (7th–8th century) and Uyghur rule (9th–13th century). The An Lushan Rebellion (755–763) led to a loss of control by the Tang-dynasty, and changed the Chan scene again. Metropolitan Chan began to lose its status, while "other schools were arising in out-lying areas controlled by warlords. These are the forerunners of the Chan we know today." During 845–846 Emperor Wuzong persecuted the Buddhist schools in China. This persecution was devastating for metropolitan Chan, but the Chan school of Mazu and his likes survived, and took a leading role in the Chan of the later Tang. After the fall of the Tang Dynasty, China was without effective central control during the Five Dynasties and Ten Kingdoms Period. China was divided into several autonomous regions. Support for Buddhism was limited to a few areas. The Hua-yen and T'ient-tai schools suffered from the changing circumstances, since they had depended on imperial support. The collapse of T'ang society also deprived the aristocratic classes of wealth and influence, which meant a further drawback for Buddhism. Shenxiu's Northern School and Henshui's Southern School didn't survive the changing circumstances. Nevertheless, chán emerged as the dominant stream within Chinese Buddhism, but with various schools developing various emphases in their teachings, due to the regional orientation of the period. The Fayan school, named after Fa-yen Wen-i (885–958) became the dominant school in the southern kingdoms of Nan-T'ang (Jiangxi, Chiang-hsi) and Wuyue (Che-chiang). The Linji school became the dominant school within Chán, due to support from literati and the court. Before the Song Dynasty, the Linji-school is rather obscure, and very little is known about its early history. The first mention of Linji is in the Zutang ji, compiled in 952, 86 years after Linji's death. But the Zutang ji pictures the Xuefeng Yicun lineage as heir to the legacy of Mazu and the Hongzhou-school. According to Welter, the real founder of the Linji-school was Shoushan (or Baoying) Shengnian (首山省念)(926–993), a fourth generation dharma-heir of Linji. The Tiansheng Guangdeng lu (天聖廣燈錄), "Tiansheng Era Expanded Lamp Record", compiled by the official Li Zunxu (李遵勗)(988–1038) confirms the status of Shoushan Shengnian, but also pictures Linji as a major Chan patriarch and heir to the Mazu, displacing the prominence of the Fayan-lineage. It also established the slogan of "a special transmission outside the teaching", supporting the Linji-school claim of "Chan as separate from and superior to all other Buddhist teachings". During the 12th century, a clear difference between the Linji and the Caodong schools emerged. The two schools were competing for support of the literati, who became more powerful when the Song-government started to limit their influence on society. Hongzhi Zhengjue (1091–1157) of the Caodong-school emphasized silent illumination or shikantaza as a means for solitary practice, which could be undertaken by lay-followers. Dahui Zonggao (1089–1163) introduced k'an-hua practice, "observing the word-head", as a means of solitary practice. The Yuan Dynasty was the empire established by Kublai Khan, the leader of Mongolian Borjigin clan, after Mongol conquered the Jin and the Southern Song dynasty in China. Chán-teachings started to be mixed with Pure Land teachings, as in the teachings of Zhongfeng Mingben (1263–1323). After further centuries of decline during the Qing Dynasty (1644–1912), Chán was revived again in the early 20th century by Hsu Yun (虛雲) (1840–1959), a well-known figure of 20th-century Chinese Buddhism. Many Chán teachers today trace their lineage back to Hsu Yun, including Sheng-yen (聖嚴) and Hsuan Hua (宣化), who have propagated Chán in the West where it has grown steadily through the 20th and 21st centuries. Chán was repressed in China during the 1960s in the Cultural Revolution, but subsequently has been re-asserting itself[ត្រូវការអំណះអំណាង] on the mainland, and has a significant following in Taiwan and Hong Kong as well as among Overseas Chinese. According to traditional accounts of Vietnam, in 580 an Indian monk named Vinitaruci (វៀតណាម ៖ Tì-ni-đa-lưu-chi) travelled to Vietnam after completing his studies with Sengcan, the third patriarch of Chinese Chán. This, then, would be the first appearance of Vietnamese Thiền Buddhism. Other early Vietnamese Chán schools included the Vô Ngôn Thông, which was associated with the teaching of Mazu, and the Thảo Đường, which incorporated nianfo chanting techniques; both were founded by Chinese monks. Zen was not introduced as a separate school until the 12th century, when Myōan Eisai traveled to China and returned to establish a Linji lineage, which eventually perished. [web ១៣] Decades later, Nanpo Shōmyō (南浦紹明?) (1235–1308) also studied Linji teachings in China before founding the Japanese Otokan lineage, the most influential and only surviving lineage of Rinzai in Japan. [web ១៣] In 1215, Dōgen, a younger contemporary of Eisai's, journeyed to China himself, where he became a disciple of the Caodong master Tiantong Rujing. After his return, Dōgen established the Sōtō school, the Japanese branch of Caodong. The three traditional schools of Zen in contemporary Japan are the Sōtō (曹洞? ), Rinzai (臨済? ), and Ōbaku (黃檗?). Of these, Sōtō is the largest, and Ōbaku the smallest, with Rinzai in the middle. These schools are further divided into subschools by head temple, with two head temples for Sōtō (Sōji-ji and Eihei-ji, with Sōji-ji having a much larger network), fourteen head temples for Rinzai, and one head temple (Manpuku-ji) for Ōbaku, for a total of 17 head temples. The Rinzai head temples, which are most numerous, have substantial overlap with the traditional Five Mountain System, and include Myoshin-ji, Nanzen-ji, Tenryū-ji, Daitoku-ji, and Tofuku-ji, among others. 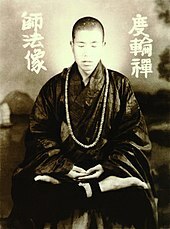 Although it is difficult to trace the precise moment when the West first became aware of Zen as a distinct form of Buddhism, the visit of Soyen Shaku, a Japanese Zen monk, to Chicago during the World Parliament of Religions in 1893 is often pointed to as an event that enhanced the profile of Zen in the Western world. It was during the late 1950s and the early 1960s that the number of Westerners other than the descendants of Asian immigrants who were pursuing a serious interest in Zen began to reach a significant level. Japanese Zen has gained the greatest popularity in the West. The various books on Zen by Reginald Horace Blyth, Alan Watts, Philip Kapleau and D. T. Suzuki[ត្រូវការអំណះអំណាង] published between 1950 and 1975, contributed to this growing interest in Zen in the West, as did the interest on the part of beat poets such as Jack Kerouac, Allen Ginsberg and Gary Snyder. ↑ During the Ming dynasty (1368–1644) and the Qing Dynasty (1644–1912) Chán was part of a larger, syncretic Buddhist culture. A final phase can be distinguished from the 19th century onward, when western imperialism had a growing influence in South-East Asia, including China. A side effect of this imperial influence was the modernisation of Asian religions, adapting them to western ideas and rhetorical strategies. ↑ ២,០ ២,១ Dumoulin 2005a, p. xvii. ↑ ៥,០ ៥,១ ៥,២ ៥,៣ ៥,៤ ៥,៥ Poceski Year unknown. ↑ ១៤,០ ១៤,១ Lachs 2006. ↑ ១៦,០ ១៦,១ Dumoulin 2005a, p. 85-94. ↑ ១៨,០ ១៨,១ ១៨,២ Cheng 1981. ↑ ២១,០ ២១,១ Kalupahana 1994, p. 228-236. ↑ ២៣,០ ២៣,១ Low 2006. ↑ Cleary 2010, p. xii–xiii, quoting Hakuin. ↑ ៣៣,០ ៣៣,១ ៣៣,២ ៣៣,៣ Kapleau 1989. ↑ ៣៧,០ ៣៧,១ ៣៧,២ Sharf 1995c. ↑ ៣៩,០ ៣៩,១ Low 2000. ↑ ៤៣,០០ ៤៣,០១ ៤៣,០២ ៤៣,០៣ ៤៣,០៤ ៤៣,០៥ ៤៣,០៦ ៤៣,០៧ ៤៣,០៨ ៤៣,០៩ ៤៣,១០ ៤៣,១១ ៤៣,១២ ៤៣,១៣ ៤៣,១៤ ៤៣,១៥ McRae 2003. ↑ ៤៤,០ ៤៤,១ Welter 2000. ↑ ៥២,០ ៥២,១ ៥២,២ ៥២,៣ ៥២,៤ ៥២,៥ ៥២,៦ ៥២,៧ ៥២,៨ ៥២,៩ Lai 2003, p. 17. ↑ ៥៣,០ ៥៣,១ McRae 2003, p. 62. ↑ ៥៤,០ ៥៤,១ ៥៤,២ ៥៤,៣ ៥៤,៤ Lai 2003, p. 18. ↑ ៥៨,០ ៥៨,១ Dumoulin 2005a, p. 45-49. ↑ ៦០,០ ៦០,១ ៦០,២ Lai 2003. ↑ ៦៤,០ ៦៤,១ Koné 2000. ↑ ៦៥,០ ៦៥,១ Sharf 1995b. ↑ ៧១,០ ៧១,១ ៧១,២ McMahan 2008. ↑ ៧៧,០ ៧៧,១ Heine 2008, p. 6. ↑ ៨១,០ ៨១,១ ៨១,២ Ferguson 2000, p. 3. ↑ McRae 2003, p. 13, 15–17. ↑ McRae 2003, p. 13, 17–18. ↑ McRae 2003, p. 13, 18–19. ↑ McRae 2003, p. 13, 19–21. ↑ ៩២,០ ៩២,១ Brown Holt 1995. ↑ ៩៥,០ ៩៥,១ ៩៥,២ ៩៥,៣ Fowler 2005, p. 79. ↑ ៩៦,០ ៩៦,១ Grigg 1994. ↑ ៩៨,០ ៩៨,១ ៩៨,២ Oh 2000. ↑ ១០៣,០ ១០៣,១ Dumoulin 2005a, p. 168. ↑ ១០៨,០ ១០៨,១ ១០៨,២ ១០៨,៣ ១០៨,៤ Whalen Lai 1985. ↑ ១១០,០ ១១០,១ ១១០,២ ១១០,៣ ១១០,៤ ១១០,៥ ១១០,៦ Dumoulin 2005a. ↑ ១១៧,០ ១១៧,១ Yampolski 2003a, p. 15. ↑ ១២១,០ ១២១,១ ១២១,២ ១២១,៣ Welter year unknownb. Abe, Masao; William R. LeFleur (translator) (1989), [Expression error: Unrecognized punctuation character "១". Zen and Western Thought], University of Hawaii Press, Expression error: Unrecognized punctuation character "១". Abe, Masao; Heine, Seteven (1996), [Expression error: Unrecognized punctuation character "១". Zen and Comparative Studies], University of Hawaii Press, Expression error: Unrecognized punctuation character "១". Aitken, Robert (1994), [Expression error: Unrecognized punctuation character "១". Foreword to "A Buddhist Bible"], Boston, Massachusetts: Beacon Press, Expression error: Unrecognized punctuation character "១". Anderson, Reb (2000), [Expression error: Unrecognized punctuation character "១". Being Upright: Zen Meditation and the Bodhisattva Precepts], Rodmell Press, Expression error: Unrecognized punctuation character "១". Arokiasamy, Arul M. (2005), [Expression error: Unrecognized punctuation character "១". Zen: Awakening to Your Original Face], Chennai, India: Thiruvanmiyur, Expression error: Unrecognized punctuation character "១". Batchelor, Martine (2004), [Expression error: Unrecognized punctuation character "១". The Path Of Compassion: The Bodhisattva Precepts], Rowman Altamira, Expression error: Unrecognized punctuation character "១". Bodiford, William M. (1992), [Expression error: Unrecognized punctuation character "១". "Zen in the Art of Funerals: Ritual Salvation in Japanese Buddhism"], History of Religions 32 (2): 150, Expression error: Unrecognized punctuation character "១". Bodiford, William M. (1993), [Expression error: Unrecognized punctuation character "១". Sōtō Zen in Medieval Japan], University of Hawaii Press, ល.ស.ប.អ. 0-8248-1482-7, Expression error: Unrecognized punctuation character "១". Borup, Jørn (2008), [Expression error: Unrecognized punctuation character "១". Japanese Rinzai Zen Buddhism: Myōshinji, a Living Religion], Brill Publishers, Expression error: Unrecognized punctuation character "១". Broughton, Jeffrey L. (1999), [Expression error: Unrecognized punctuation character "១". The Bodhidharma Anthology: The Earliest Records of Zen], Berkeley: University of California Press, ល.ស.ប.អ. 0-520-21972-4, Expression error: Unrecognized punctuation character "១". Buswell, Robert E. (1991), [Expression error: Unrecognized punctuation character "១". "The "Short-cut" Approach of K'an-hua Meditation: The Evolution of a Practical Subitism in Chinese Ch'an Buddhism". In: Peter N. Gregory (editor) (1991), Sudden and Gradual. Approaches to Enlightenment in Chinese Thought], Delhi: Motilal Banarsidass Publishers Private Limited, Expression error: Unrecognized punctuation character "១". Buswell, Robert E (1993), [Expression error: Unrecognized punctuation character "១". Ch'an Hermeneutics: A Korean View. In: Donald S. Lopez, Jr. (ed. )(1993), Buddhist Hermeneutics], Delhi: Motilal Banarsidass, Expression error: Unrecognized punctuation character "១". Blyth, R. H. (1966), [Expression error: Unrecognized punctuation character "១". Zen and Zen Classics, Volume 4], Tokyo: Hokuseido Press, Expression error: Unrecognized punctuation character "១". Chappell, David W. (1993), [Expression error: Unrecognized punctuation character "១". Hermeneutical Phases in Chinese Buddhism. In: Donald S. Lopez, Jr. (ed. )(1993), Buddhist Hermeneutics], Delhi: Motilal Banarsidass, Expression error: Unrecognized punctuation character "១". Cleary, Thomas (2010), [Expression error: Unrecognized punctuation character "១". Translator's introduction. The Undying Lamp of Zen. The Testament of Zen Master Torei], Boston & London: Shambhala Publications, Expression error: Unrecognized punctuation character "១". Collins, Randall (2000), [Expression error: Unrecognized punctuation character "១". The Sociology of Philosophies: A Global Theory of Intellectual Change], Harvard University Press, Expression error: Unrecognized punctuation character "១". Dumoulin, Heinrich (2000), [Expression error: Unrecognized punctuation character "១". A History of Zen Buddhism], New Delhi: Munshiram Manoharlal Publishers Pvt. Ltd., Expression error: Unrecognized punctuation character "១". Dumoulin, Heinrich (2005a), [Expression error: Unrecognized punctuation character "១". Zen Buddhism: A History. Volume 1: India and China], World Wisdom Books, ល.ស.ប.អ. 978-0-941532-89-1, Expression error: Unrecognized punctuation character "១". Dumoulin, Heinrich (2005b), [Expression error: Unrecognized punctuation character "១". Zen Buddhism: A History. Volume 2: Japan], World Wisdom Books, ល.ស.ប.អ. 978-0-941532-90-7, Expression error: Unrecognized punctuation character "១". Faure, Bernard (2000), [Expression error: Unrecognized punctuation character "១". Visions of Power. Imaging Medieval Japanese Buddhism], Princeton, New Jersey: Princeton University Press, Expression error: Unrecognized punctuation character "១". Ferguson, Andy (2000), [Expression error: Unrecognized punctuation character "១". Zen's Chinese Heritage], Boston, MA: Wisdom Publications, ល.ស.ប.អ. 0-86171-163-7, Expression error: Unrecognized punctuation character "១". Gimello, Robert M. (1994), [Expression error: Unrecognized punctuation character "១". Marga and Culture: Learning, Letters, and Liberation in Northern Sung Ch'an. In: Buswell & Gimello (editors)(1994), Paths to Liberation. Pages 475–505], Delhi: Motilal Banarsidass Publishers, Expression error: Unrecognized punctuation character "១". Gregory, Peter N. (1991), [Expression error: Unrecognized punctuation character "១". Sudden Enlightenment Followed by Gradual Cultivation: Tsung-mi's Analysis of mind. In: Peter N. Gregory (editor)(1991), Sudden and Gradual. Approaches to Enlightenment in Chinese Thought], Delhi: Motilal Banarsidass Publishers Private Limited, Expression error: Unrecognized punctuation character "១". Gregory, Peter N. (1993), [Expression error: Unrecognized punctuation character "១". What Happened to the "Perfect Teaching"? Another lOok at Hua-yen Buddhist hermeneutics. In: Donald S. Lopez, Jr. (ed. )(1993), Buddhist Hermeneutics], Delhi: Motilal Banarsidass, Expression error: Unrecognized punctuation character "១". Grigg, Ray (1994), [Expression error: Unrecognized punctuation character "១". The Tao Of Zen], Charles E. Tuttle Company, Expression error: Unrecognized punctuation character "១". Harvey, Peter (1995), [Expression error: Unrecognized punctuation character "១". An introduction to Buddhism. Teachings, history and practices], Cambridge University Press, Expression error: Unrecognized punctuation character "១". Haskel, Peter (1984), [Expression error: Unrecognized punctuation character "១". Bankei Zen. Translations from The Record of Bankei], New York: Grove Weidenfeld, Expression error: Unrecognized punctuation character "១". Heine, Steven (2007), [Expression error: Unrecognized punctuation character "១". "A Critical Survey of Works on Zen since Yampolsky. "], Philosophy East & West 57 (4): 577–592, Expression error: Unrecognized punctuation character "១". Heine, Steven (2008), [Expression error: Unrecognized punctuation character "១". Zen Skin, Zen Marrow], Expression error: Unrecognized punctuation character "១". Hisamatsu, Shin'ichi; Gishin Tokiwa; Christopher Ives (2002), [Expression error: Unrecognized punctuation character "១". Critical Sermons of the Zen Tradition: Hisamatsu's Talks on Linji], University of Hawaii Press, Expression error: Unrecognized punctuation character "១". Hori, Victor Sogen (2000), [Expression error: Unrecognized punctuation character "១". Koan and Kensho in the Rinzai Zen Curriculum. In: Steven Heine and Dale S. Wright (eds)(2000): "The Koan. Texts and Contexts in Zen Buddhism], Oxford: Oxford University Press, Expression error: Unrecognized punctuation character "១". Huaijin, Nan (1997), [Expression error: Unrecognized punctuation character "១". Basic Buddhism: Exploring Buddhism and Zen], York Beach: Samuel Weiser, Expression error: Unrecognized punctuation character "១". Isshū, Miura; Sasaki, Ruth F. (1993), [Expression error: Unrecognized punctuation character "១". The Zen Koan], New York: Harcourt Brace & Company, ល.ស.ប.អ. 0-15-699981-1, Expression error: Unrecognized punctuation character "១". Jorgensen, John (1991), [Expression error: Unrecognized punctuation character "១". "Heinrich Dumoulin's Zen Buddhism: A History"], Japanese Journal of Religious Studies 18 (4), Expression error: Unrecognized punctuation character "១". Kalupahana, David J. (1992), [Expression error: Unrecognized punctuation character "១". The Principles of Buddhist Psychology], Delhi: ri Satguru Publications, Expression error: Unrecognized punctuation character "១". Kalupahana, David J. (1994), [Expression error: Unrecognized punctuation character "១". A history of Buddhist philosophy], Delhi: Motilal Banarsidass Publishers Private Limited, Expression error: Unrecognized punctuation character "១". Kapleau, Philip (1989), [Expression error: Unrecognized punctuation character "១". The three pillars of Zen], Expression error: Unrecognized punctuation character "១". Kasulis, Thomas P. (2003), [Expression error: Unrecognized punctuation character "១". Ch'an Spirituality. In: Buddhist Spirituality. Later China, Korea, Japan and the Modern World; edited by Takeuchi Yoshinori], Delhi: Motilal Banarsidass, Expression error: Unrecognized punctuation character "១". Katz, Jerry (2007), [Expression error: Unrecognized punctuation character "១". One: Essential Writings on Nonduality], Sentient Publications, Expression error: Unrecognized punctuation character "១". Lathouwers, Ton (2000), [Expression error: Unrecognized punctuation character "១". Meer dan een mens kan doen. Zentoespraken], Rotterdam: Asoka, Expression error: Unrecognized punctuation character "១". Liang-Chieh (1986), [Expression error: Unrecognized punctuation character "១". The Record of Tung-shan], Kuroda Institute (translator: William F. Powell), Expression error: Unrecognized punctuation character "១". Lievens, Bavo (1981), [Expression error: Unrecognized punctuation character "១". Ma-tsu. De gesprekken], Bussum: Het Wereldvenster, Expression error: Unrecognized punctuation character "១". Loori, John Daido (2006), [Expression error: Unrecognized punctuation character "១". Sitting with Koans: Essential Writings on Zen Koan Introspection], Wisdom Publications, ល.ស.ប.អ. 0-86171-369-9, Expression error: Unrecognized punctuation character "១". Low, Albert (2000), [Expression error: Unrecognized punctuation character "១". Zen and the Sutras], Boston: Turtle Publishing, Expression error: Unrecognized punctuation character "១". Low, Albert (2006), [Expression error: Unrecognized punctuation character "១". Hakuin on Kensho. The Four Ways of Knowing], Boston & London: Shambhala, Expression error: Unrecognized punctuation character "១". Maezumi, Taizan; Glassman, Bernie (2007), [Expression error: Unrecognized punctuation character "១". The Hazy Moon of Enlightenment], Wisdom Publications, Expression error: Unrecognized punctuation character "១". Matthiessen, Peter (1987), [Expression error: Unrecognized punctuation character "១". Nine-headed dragon river: Zen journals, 1969–1985], Shambhala, Expression error: Unrecognized punctuation character "១". McCauley, Charles (2005), [Expression error: Unrecognized punctuation character "១". Zen and the Art of Wholeness], iUniverse, Expression error: Unrecognized punctuation character "១". McMahan, David L. (2008), [Expression error: Unrecognized punctuation character "១". The Making of Buddhist Modernism], Oxford University Press, ល.ស.ប.អ. 978-0-19-518327-6, Expression error: Unrecognized punctuation character "១". McRae, John (1991), [Expression error: Unrecognized punctuation character "១". Shen-hui and the Teaching of Sudden Enlightenment in Early Ch'an Buddhism. In: Peter N. Gregory (editor)(1991), Sudden and Gradual. Approaches to Enlightenment in Chinese Thought], Delhi: Motilal Banarsidass Publishers Private Limited, Expression error: Unrecognized punctuation character "១". Mumon, Yamada (2004), [Expression error: Unrecognized punctuation character "១". The Ten Oxherding Pictures], University of Hawai'i press (translator: Victor Sōgen Hori), Expression error: Unrecognized punctuation character "១". Nadeau, Randall L. (2012), [Expression error: Unrecognized punctuation character "១". The Wiley-Blackwell Companion to Chinese Religions], John Wiley & Sons, Expression error: Unrecognized punctuation character "១". Newland, Guy, [Expression error: Unrecognized punctuation character "១". Schijn en werkelijkheid. De twee waarheden in de vier boeddhistische leerstelsels], KunchabPublicaties, Expression error: Unrecognized punctuation character "១". Pajin, Dusan (1988), [Expression error: Unrecognized punctuation character "១". "On Faith in Mind – Translation and Analysis of the Hsin Hsin Ming"], Journal of Oriental Studies 26 (2): 270–288, Expression error: Unrecognized punctuation character "១". Schlütter, Morten (2008), [Expression error: Unrecognized punctuation character "១". How Zen became Zen. The Dispute over Enlightenment and the Formation of Chan Buddhism in Song-Dynasty China], Honolulu: University of Hawai'i Press, ល.ស.ប.អ. 978-0-8248-3508-8, Expression error: Unrecognized punctuation character "១". Sekida, Katsuki (1989), [Expression error: Unrecognized punctuation character "១". Zen Training: Methods and Philosophy], Shambhala, Expression error: Unrecognized punctuation character "១". Sekida, Katuski (1996), [Expression error: Unrecognized punctuation character "១". Two Zen Classics. Mumonkan, the gateless gate. Hekiganroku, the blue cliff record], New York & Tokyo: Weatherhill, Expression error: Unrecognized punctuation character "១". Shimano, Eido T. (1991), [Expression error: Unrecognized punctuation character "១". Points of Departure: Zen Buddhism With a Rinzai View], Livingston Manor, NY: The Zen Studies Society Press, ល.ស.ប.អ. 0-9629246-0-1, Expression error: Unrecognized punctuation character "១". Snelling, John (1987), [Expression error: Unrecognized punctuation character "១". The Buddhist handbook. A Complete Guide to Buddhist Teaching and Practice], London: Century Paperbacks, Expression error: Unrecognized punctuation character "១". Swanson, Paul L. (1993), [Expression error: Unrecognized punctuation character "១". "The Spirituality of Emptiness in Early chinese Buddhism"], ជា Takeuchi Yoshinori, Buddhist Spirituality. Indian, Southeast Asian, Tibetan, Early Chinese, New York: Crossroad, Expression error: Unrecognized punctuation character "១". Tomoaki, Tsuchida (2003), [Expression error: Unrecognized punctuation character "១". "The Monastic spirituality of Zen Master Dogen"], ជា Takeuchi Yoshinori, Buddhist Spirituality. Indian, Southeast Asian, Tibetan, Early Chinese, Delhi: Motilal Banarsidass, Expression error: Unrecognized punctuation character "១". Torei (2010), [Expression error: Unrecognized punctuation character "១". The Undying Lamp of Zen. The Testament of Zen Master Torei], Boston & London: Shambhala (translator: Thomas Cleary), Expression error: Unrecognized punctuation character "១". Victoria, Brian Daizen (2006), [Expression error: Unrecognized punctuation character "១". Zen at war] (Second រ.រ. ), Lanham e.a. : Rowman & Littlefield Publishers, Inc., Expression error: Unrecognized punctuation character "១". Waddell, Norman (2010), [Expression error: Unrecognized punctuation character "១". Foreword to "Wild Ivy: The Spiritual Autobiography of Zen Master Hakuin"], Shambhala Publications, Expression error: Unrecognized punctuation character "១". Wai-tao (translator) (1994), [Expression error: Unrecognized punctuation character "១". "The Diamond Sutra"], A Buddhist Bible, Boston, Massachusetts: Beacon Press, Expression error: Unrecognized punctuation character "១". Wayman, Alex and Hideko (1990), [Expression error: Unrecognized punctuation character "១". The Lion's roar of Queen Srimala], Delhi: Motilal Banarsidass Publishers, Expression error: Unrecognized punctuation character "១". Welter, Albert (2000), [Expression error: Unrecognized punctuation character "១". Mahakasyapa's smile. Silent Transmission and the Kung-an (Koan) Tradition. In: Steven Heine and Dale S. Wright (eds)(2000): "The Koan. Texts and Contexts in Zen Buddhism], Oxford: Oxford University Press, Expression error: Unrecognized punctuation character "១". Wolfe, Robert (2009), [Expression error: Unrecognized punctuation character "១". Living Nonduality: Enlightenment Teachings of Self-Realization], Karina Library, Expression error: Unrecognized punctuation character "១". Wright, Dale S. (2010), [Expression error: Unrecognized punctuation character "១". "Humanizing the Image of a Zen master: Taizan Maezumi Roshi"], ជា Steven Heine and Dale S. Wright, Zen Masters, Oxford: Oxford University Press, Expression error: Unrecognized punctuation character "១". Yampolski, Philip (1967), [Expression error: Unrecognized punctuation character "១". The Platform Sutra of the Sixth Patriarch. Translated with notes by Philip B. Yampolsky], Columbia University Press, ល.ស.ប.អ. 0-231-08361-0, Expression error: Unrecognized punctuation character "១". Yampolski, Philip (2003a), [Expression error: Unrecognized punctuation character "១". "Chan. A Historical Sketch. "], ជា Takeuchi Yoshinori, Buddhist Spirituality. Indian, Southeast Asian, Tibetan, Early Chinese, Delhi: Motilal Banarsidass, Expression error: Unrecognized punctuation character "១". Yampolski, Philip (2003b), [Expression error: Unrecognized punctuation character "១". "Zen. A Historical Sketch"], ជា Takeuchi Yoshinori, Buddhist Spirituality. Indian, Southeast Asian, Tibetan, Early Chinese, Delhi: Motilal Banarsidass, Expression error: Unrecognized punctuation character "១". Yen, Chan Master Sheng (1996), [Expression error: Unrecognized punctuation character "១". Dharma Drum: The Life and Heart of Ch'an Practice], Boston & London: Shambhala, Expression error: Unrecognized punctuation character "១". Yoshizawa, Katsuhiro (2009), [Expression error: Unrecognized punctuation character "១". The Religious Art of Zen Master Hakuin], Counterpoint Press, Expression error: Unrecognized punctuation character "១". ↑ Thich Hang Dat, A REAPPRAISAL OF KUMĀRAJĪVA’S ROLE IN MEDIEVAL CHINESE BUDDHISM: AN EXAMINATION OF KUMĀRAJĪVA’S TRANSLATION TEXT ON “THE ESSENTIAL EXPLANATION OF THE METHOD OF DHYANA” Archived May 18, 2015, at the វេយប៊ែខ ម៉ាស៊ីន. King, Richard (2002), [Expression error: Unrecognized punctuation character "១". Orientalism and Religion: Post-Colonial Theory, India and "The Mystic East"], Routledge, Expression error: Unrecognized punctuation character "១". Borup, Jørn (2008), [Expression error: Unrecognized punctuation character "១". Japanese Rinzai Zen Buddhism: Myōshinji, a Living Religion], Brill, Expression error: Unrecognized punctuation character "១". Buswell, Robert E. (1993a), [Expression error: Unrecognized punctuation character "១". The Zen Monastic Experience: Buddhist Practice in Contemporary Korea], Princeton University Press, Expression error: Unrecognized punctuation character "១".